There are dozens of myths revolving around the story of this remarkable woman. As it always goes with legends, not all of them are true. 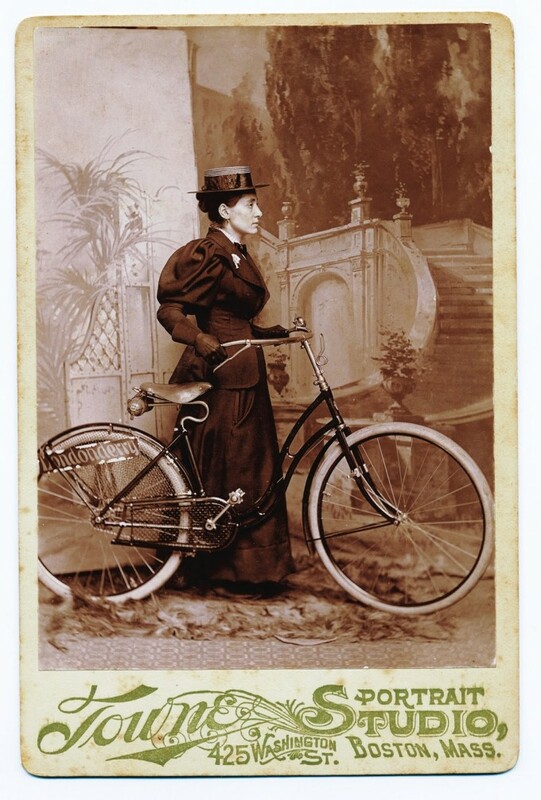 But one fact remains: Annie Londonderry was certainly the first woman to ride around the world on a bicycle. As any interesting story, even this one begins in a pub. Supposedly, one night Annie encountered two men arguing over a beer in a bar in Boston. The question was if a woman has the ability to ride around the world on two wheels. The brave lady would jump into their conversation to prove the two thickheads wrong. Womankind can cope just as good as mankind, and would she show them. If Annie wins the bet, her reward will be no less than $10,000. Who cares that she never sat on a bike before. Even though there is no real evidence of the event, and it seems that it’s just one of many fairytales Annie made up, one thing is for sure. 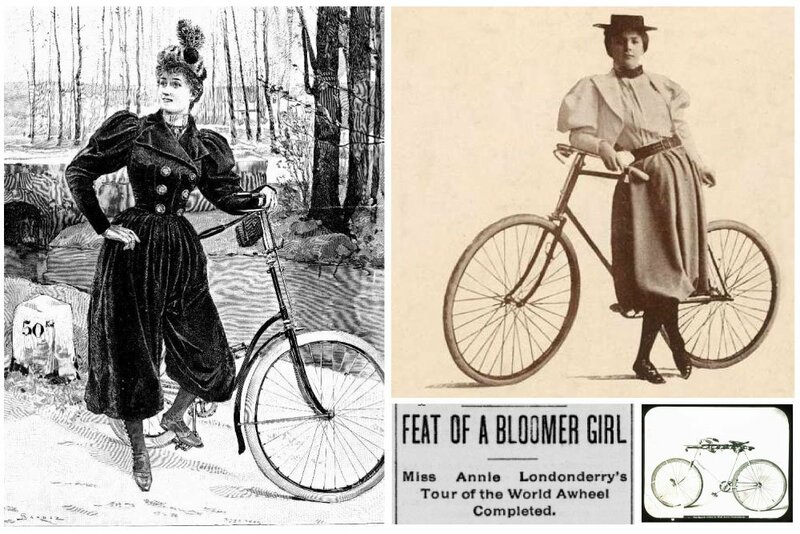 On 25th June 1894, sitting on a 42-pound Columbia women’s bike, Londonderry set off on the journey from Chicago. Back in the 1890s, there was no company sponsoring female riders in their endeavours. But that didn’t stop the resourceful woman who arranged for her own corporate sponsorship anyway. Wearing a Londonderry Lithia Spring Water Company transparent on her bicycle, Annie (born as Cohen Kopchovsky) also agreed to change her surname to Londonderry and cashed a $100 reward from the company. 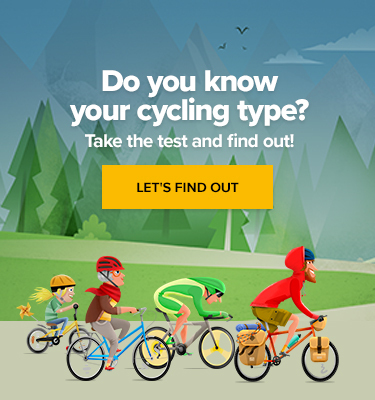 Gimme a men’s bicycle and a riding suit! Upon her arrival to Chicago in September of the same year, dressed in a long Victorian dress, Annie was 20 pounds lighter and 100 per cent determined to go further. She was also very much exhausted. So naturally, a change had to be made. Annie exchanged the heavy bike for a men’s bicycle, which turned out to weigh about a half less. Tossing away the dress and switching to bloomers, Londonderry headed to Europe. To be accurate, she did not pedal across the ocean. A ferry helped her to get to France and a couple of trains to move across the country. Sailing or riding? Potato patato! From Marseille, the adventurous pioneer took a steamship to Asia. Actually, sailing became quite a regular way of getting from one spot to another for Annie. There was no agreement on a minimum distance she had to travel on wheels, and so Annie got to many other places including Colombo, Alexandria or Singapore. Finally, in March 1895, she boarded a ship from Japan to San Francisco. A little more wheeling across America and in September 1895, 15 months after the departure, Annie got back to Chicago. She may not have travelled the whole journey on a bicycle. She may not have visited all the countries along the way. She may have lied a bit about her numerous adventures, encounters or injuries. But she definitely did it. At the end of the 19th century, Annie Londonderry rode around the world, becoming a women’s cycling pioneer.